Wall, NJ: The Pharmafill BCV1 Bottomless Conveyor from packaging machinery manufacturer Deitz Co., Wall, NJ (www.Deitzco.com), replaces dead plates, lane separators and other passive diverters with a powered, active mechanism that enables packaging engineers to transfer bottles and other glass and plastic containers from one conveyor or packaging machine to another safely and smoothly. By eliminating passive approaches and their reliance on backpressure from the accumulated containers to transfer the bottles, the automated Bottomless Conveyor promotes safe, efficient, consistent movement from one point to another without tipping, stopping, stalling or spilling the bottles. 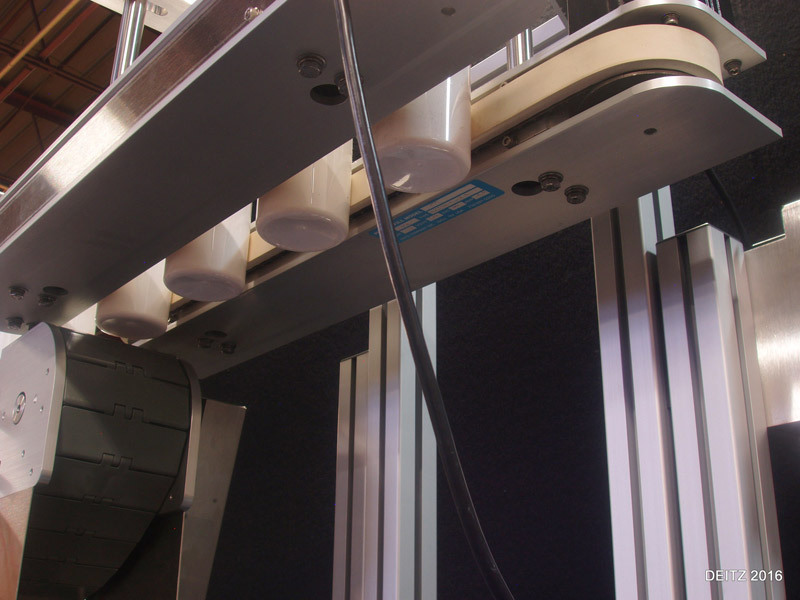 Installed next to a standard conveyor, the bottomless hugger belt system accepts empty or filled bottles at the infeed, grips them between dual, powered side belts, and gently conveys them at a choice of speeds towards discharge onto a standard conveyor. While in transit, the bottles may be conveyed over a printer for marking lot codes, serial numbers and/or other information on the bottoms without stopping or disrupting the flow. To be showcased at the Deitz Pack Expo booth #S-1410 on Oct. 14, 2018 in Las Vegas, Nevada, the versatile conveyor may be easily adjusted in height and width to accommodate virtually any bottle size or shape and is offered with an optional, adjustable-height lift stand to match the height to existing equipment. The sanitary conveyor for transfers is manufactured in the company’s Wall, New Jersey, headquarters, and ships fully tested and assembled on casters for easy installation and movement around the packaging line.